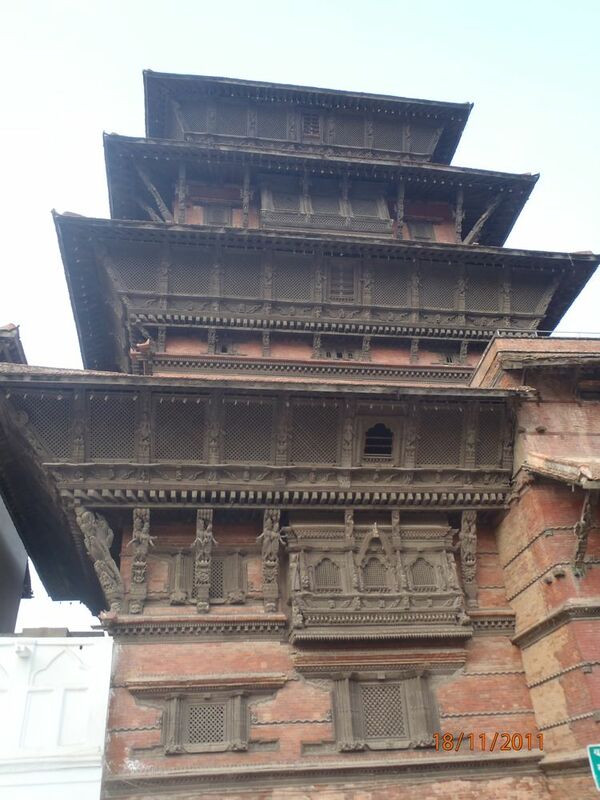 Kathmandu has almost the ring of Timbuktu to it and here I am. Have spent 4 days so far here, mostly on bike stuff. After a couple of tries to find the right mechanic, I was pointed to Faruck at Himalayan Enfielders. One of the very best mechanics I have come across, not only a perfectionist, but also with a completely 'can do' attitude. His team of 4-5 other guys support him and he is clearly so well regarded by them and all the customers who came in non stop...and interrupting his work on Batty. Batty needed her front forks and rear suspension renewed, and then being brave we took the cylinder head off. I was surprised at how relatively clean the piston was. Only a thin coat of carbon. The shock came with the valves. Both were pretty wobbly in their seats and the build up of gunge around the inlet valve was dramatic. The penalty for using veg oil in the way that I am. Hopefully the new 2 fuel system will aleviate some of this trouble. Not a pretty sight, the gunge inside the left hole amounted to about 2 tablespoons full and beginning to slow me down. My immediate thought was that this would ground me till we could get some spares from UK. Without even a moments thought from Faruck, he was off to a local shop where he found some exact same size valves, that were a bit to long. These were lathed to size, the seats and guides renewed and all done in about 5 hours. There are always many hours of hanging around on these occasions. Mostly one is frustratingly in the dark with the occasional translation, but the good thing is that there are often others hanging around waiting for their bikes to be sorted as well. 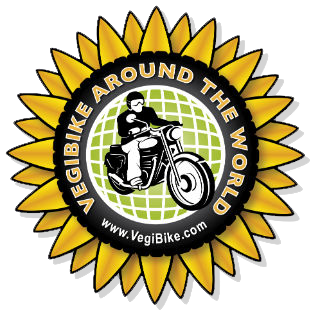 Now I may be a bit biased but the Royal Enfield rider is, by and large, a pretty bright and interesting man (only one lady rider that I have seen so far), so these are pretty good opportunities to get some low down. In particular Kirian, who also has a diesel Enfield, was a convivial fellow 'waiter'. He is mainly involved in running some properties, but he is fascinated by sustainable energy and has built some wind turbines from plans he found on the internet. Also his father and he have put electrical solar panels on a village school to run the computers. Their latest scheme is to set up some water micro turbines, that are powering 20 houses in a village. It is good to see this sort of thing happening and really making life easier for many, and points to ways we will all have to adopt before we kill this planet of ours. Guest houses are also great places to meet interesting people, from time to time. In the Rose Bud in Kathmandu I bumped into Miles, who is spending 2 months on mountain treks. He is my age and a BBC radio producer, when he is not on a 3 month sabbatical. We have had a couple of beers and suppers here I found myself shaking him by the hand, thanking him for coming up with and producing the radio series 'Great Lives' on Radio 4. One of the podcasts I love and always download to listen to on long straight roads, or of an evening. A comforting way of being at home in a foreign land. He had had a fascinating day visiting an orphanage that he brought some clothes out for. He ended up joining the lady who ran it on a jail visit. Most of the kids dad's were there. He described pretty torrid conditions and a system that had people waiting for trial for between 3&5 years. This collaborated an idea I was getting from taxi drivers and Royal Enfielders that behind all the amazing smiles and the friendliest of peoples, there are lots of tensions and injustices in a new democracy that is falling short of what we would consider a fair and just system. Coincidence is a funny phenomenon. I met Simon Gill and his pal Alex for a dinner the other night who were doing one of these extraordinary running 6 Marathons in 6 days events, they mentioned they were bringing a baby car seat for some friends in Pokara. It did not take long to learn that it was for Jessica and Al, who I am due to meet up with in a week or so's time. A lovely connection of 2 of my great friend's siblings linked half way around the world on a particular few days. 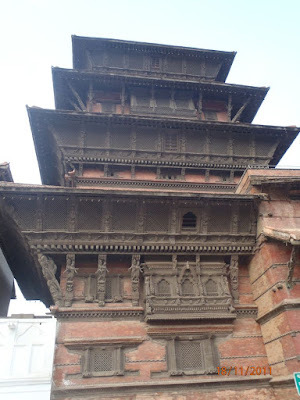 Here are a few snaps of Durbar Square in Kathmandu, which was the palace of old.